The Greek Key pattern is one I will never grow tired of! It's right up there with my obsession for the chevron (or zig zag) pattern. I did a little research on the history of this pattern and here's what I found..."The Greek Key pattern is known by many names, some of which include: Greek Fret, Greek Key, Labyrinth, Maze and Key Patterns. The pattern originates from Greek mythology and is symbolic of the labyrinth that imprisoned the Minotaur, which was described as a creature with the head of a bull and the body of a man." I found that to be quite interesting! 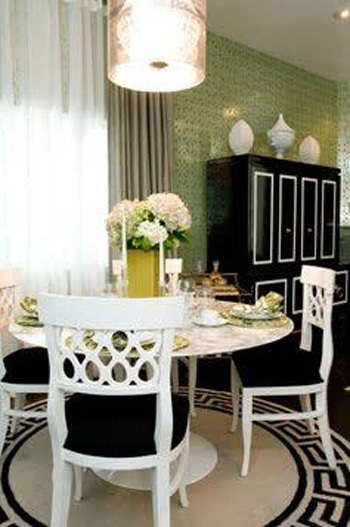 We've seen this bold geometric pattern used throughout history in jewelry, clothing, furniture, etc. It's proven to be a classic and timeless pattern that's versatile enough to be used in both traditional and modern interiors, and everything in between. What do you think of the Greek Key pattern? How would you incorporate it into your decor? I'd love to hear your thoughts! 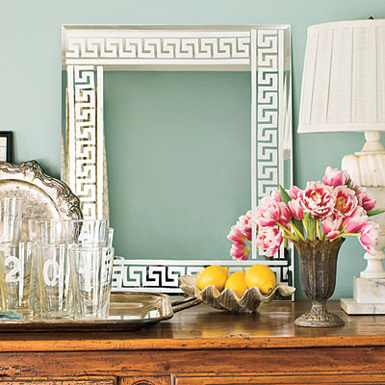 I love the pattern on the side of that console table! 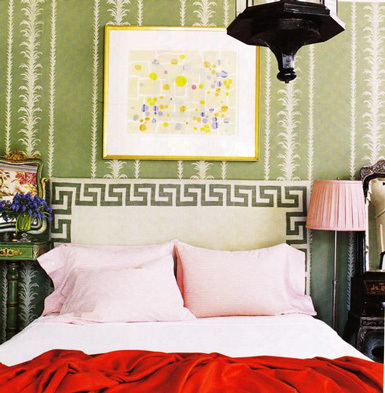 Greek patterns absolutely takes elegance to the next level. To night I am posting my first DIY on a Louie XV stool. I used turqouise chevron frabric and am doing the second paint layer of white in a second. I would be honored if you would pop by later and let me know what you think! It's really beautiful and so timeless! I would absolutely use it it my home especially on bed linen. i am insane for greek key patterns!!! The console table above is just gorgeous! 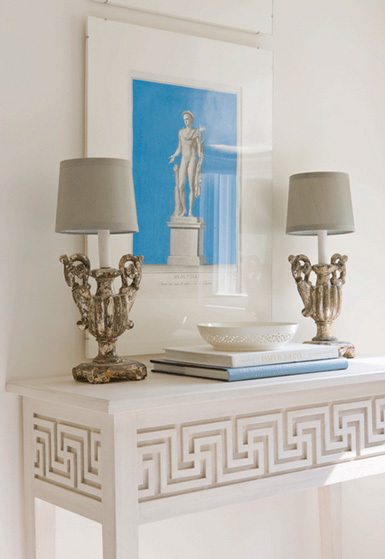 I particularly love Greek key cornice molding, I know it would be overkill but I could have it in every room! Yes, I love this look!! 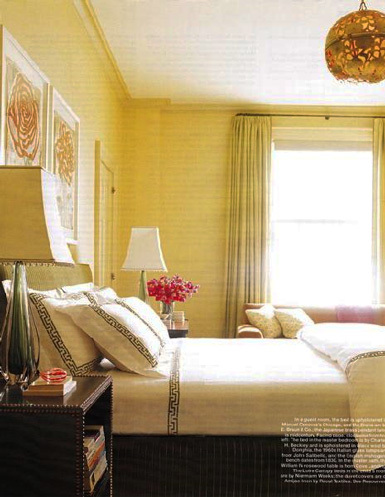 Beautiful rooms. Ha! Love it too! Drool worthy.... All of it! Thanks for the eye candy! Love the first image, this pattern is so timeless. Thanks for sharing. Love this new duvet from West Elm. Greek Key has been and will always be one of my favorite classic elements of design. It's stunning any way it's used! Love the images you've shown. I agree!! It's a classic and will always be popular with me too! Greek Key Pattern is very classic had will always make its way back into timeless design. Thank you for such great decor pictures. Love it too! 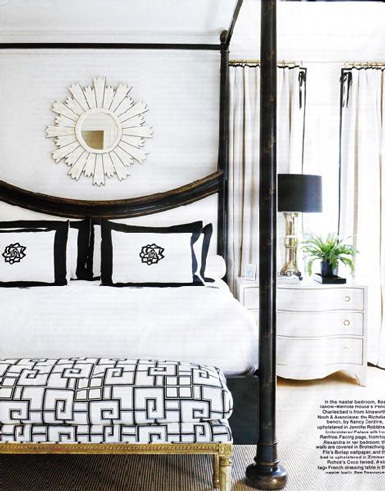 Nate Berkus did a show on it not too long ago and showed simple tricks to add it to pillows and everything. I ABSOLUTELY LOVE the tan head board in the top picture with the gray walls. Do you know where to find it?